My first question was, “What is a time crystal?” Harvard graduate students Soonwon Choi, Joonhee Choi and postdoctoral researcher Renate Landig all started laughing. “That’s a very good question,” said Soonwon. The time crystal’s silly science fiction name shrouds its deep quantum mechanical nuance. Sometimes a name is simply the easiest approximation to describe something far more complex than inquiring minds can conjure. Two groups of scientists report that they’ve observed exotic time crystals, systems of atoms whose properties arrange themselves, or “crystallize” in time like the way solids can crystallize in space. The two groups’ vastly different atomic arrangements aren’t perpetual motion machines, weapons, or time travel devices—but their strange behavior sheds light on a whole new class of materials with properties different from any solid, liquid or gas you’ve ever encountered. Physical laws are laden with symmetries—instances where an action produces the same reaction in a different environment. If you punch a solid wall with the same force, it will hurt equally no matter where along the length of the wall you punch it or what time of day it is—those are spatial and time translation symmetries. Some symmetries can break. Crystals, solids where particles arrange themselves in a lattice, break a so-called spatial translational symmetry, since the molecules prefer a specific place in space. If you had a picket fence instead of a solid wall, that might break a spatial translational symmetry, since punching a picket feels different than punching the space between planks. Wilczek’s idea was simple: Can molecules break time translational symmetry? Can certain solids crystallize in time, preferring different states at different time intervals? That question became: Do certain periodic behaviors of a collection of atoms have preferred tempos? This would kind of be like 17-year cicadas—they could come every year, but instead they break a time translational symmetry, since they clump on the 17th year rather than appearing evenly every year. Physicists Haruki Watanabe and Masaki Oshikawa from the University of Tokyo realized in 2014 that, no, there probably aren’t time crystals, at least not in the way Wilczek defined them. Two years later, physicists including Shivaji Sondhi at Princeton and Chetan Nayak-from the University of California, Santa Barbara demonstrated that time crystals might exist if you changed the rules a little bit—by giving atoms a periodic nudge, for example. Physicist Norman Yao at the University of California, Berkeley drafted up a sort of blueprint for what to measure to convince researchers they’d created a time crystal. The discoveries both came out in preprint a few weeks ago, but they have now been vetted via the peer review process. “The surprising thing about the time crystal is that it’s stable,” Yao told Gizmodo. The time crystal would need to prefer a certain vibrational frequency, different from the frequency of the periodic nudge. Under a few nudges, the preferred vibrational frequency doesn’t change. That’s what each group is reporting today in the journal Nature. Particles have an innate quantum mechanical property called “spin” related to magnetism, which in the case of these crystals, has two different values. The values all align, and swap back and forth at the time crystal’s preferred tempo. Precisely understanding spin isn’t so important for understanding time crystals—at a really basic level, just think of it like each particle as a spectator at a sports game holding a sign. If everyone holds up side A, the collective signs say one phrase, and if they all hold up side B, it says a different phrase. Otherwise, it’s a garbled mess. One group at the University of Maryland lined up ten trapped ytterbium ions (ytterbium is just a chemical element) and shined them with periodic laser pulses to mostly, but not completely, flip the ions’ spins. The particles’ spin values snapped into place, completely flipping regardless. They continued flipping and all lining up at half the speed of the laser pulse. If the team altered the pulse a little bit, the ten ions kept with their same cycle, even though intuition says the time crystal’s periodic motion should eventually fall apart. Instead, they preferred to march at the beat of their own drum. The Harvard group’s setup was a little different. They loaded the regular carbon lattice of a diamond with impurities in the form of nitrogen atoms—so many impurities that the diamond turned black. Their crystal also required a pulsing force, in this case a microwave field, and they also watched the impurities’ spins flip back and forth, snapping into place with their own lower frequency, a longer period. This caused the diamond to fluoresce, like in the picture below. Their system was so complex that the theory doesn’t fully explain the behavior, said Soonwon Choi. If you’re still a little confused, Yao’s got a great boilerplate explanation: If you’re jumping rope, you expect a rotation every time the person holding the rope’s hand spins. These time crystals have taken on a mind of their own—the rope makes a full circle, or the spins cycle, for every two times your hands spin. Furthermore, explained Zhang, jostling the rope a little bit won’t stop or alter the stable spinning. Now that you know what a time crystal is, your first thought is most certainly “that’s it? What’s so exciting about that?” (“The other day in a game I saw a time crystal as a weapon,” said Landig). Soonwon immediately brought up potential quantum computing applications in the far future, controlling lots of quantum bits at the same time. But, the importance is likely more fundamental. Normally phases of matter exist only by changing the way particles arrange in space. 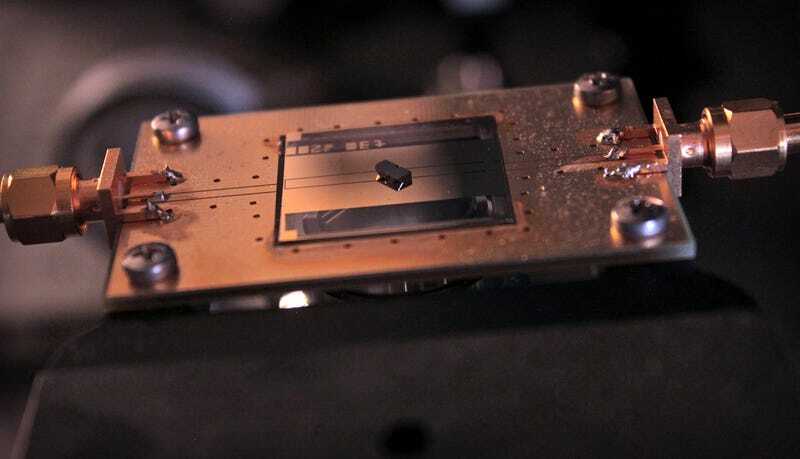 Time crystals open up a whole world of possible new phases of matter by adding these laser or microwave pulses—phases that only exist when you’re doing something to the solid, like a quantum physics version of how corn starch mixed with water only feels solid when you smack it.